Baraa’ al-Ghazzawi is arrested at al-Aqsa Mosque, August 12, 2018. Photo credit: Wadi Hilweh Information Center. Worshippers report being arrested as they exit the holy compound and then banned from praying there. There has been a marked increase in Israeli police and security forces restricting Palestinian worship at al-Aqsa Mosque in Jerusalem. On August 17, 2018, Israeli forces closed all of the gates leading to al-Aqsa. Palestinians collectively prayed outside of gates in protest of the action. Police closed the Mosque after they shot dead a Palestinian in the Old City. Police allege that before being killed the man attempted to stab Israeli officers. No officers were injured during the purported attack. On August 15, Israeli police stopped and questioned Palestinian women at Bab Isbat, one of the gates that leads to al-Aqsa. According to the Wadi Hilweh Information Center, Israeli police detained nine women from the gate and released them on the condition that they abide by a two week ban from al-Aqsa. Lawyer Khaled Zabarqa reports the Israeli police charged them with the crime of being present in and around al-Aqsa during settler tours. On August 13, Israeli police ordered two al-Aqsa Waqf officials to present themselves before Israeli intelligence due to their objection to police assaulting and arresting a Palestinian woman at one of al-Aqsa’s gates the day before. On August 12, Israeli police detained Baraa’ al-Ghazzawi and interrogated her about her presence at al-Aqsa. She reports she told intelligence officers that she goes to the site to pray, which is her right. She was released upon being banned from al-Aqsa for two weeks as well. Israeli police detained Nafisa Khuwais and Aida al-Sidawi from al-Aqsa on July 29. 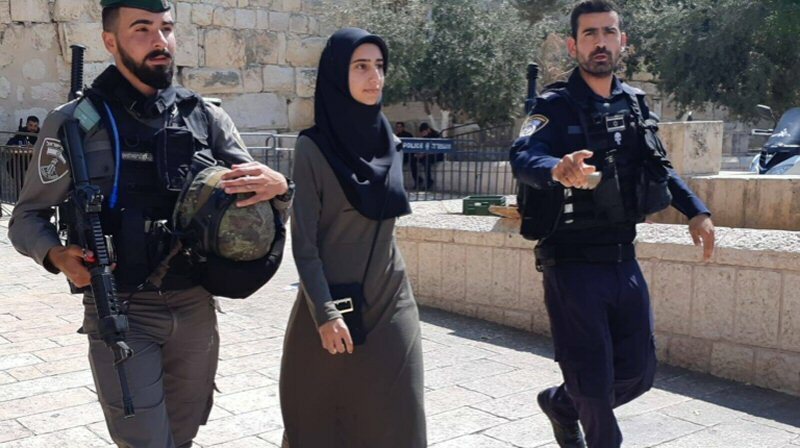 Following interrogation, the two women were released that day on the condition that they do not enter or attempt to enter al-Aqsa Mosque for two weeks. Palestinian media reports that Khuwais was detained when she arrived at the police station in the Old City to retrieve her ID. Israeli police often confiscate the IDs of Palestinians entering al-Aqsa, which forces worshippers to approach police to retrieve their ID as they exit the compound. This system empowers Israeli police to quietly arrest any Palestinian who prays at al-Aqsa. On July 27, around 40 Palestinians sustained injuries from rubber coated steel bullets, tear gas and sound grenades, which Israeli forces shot in al-Aqsa Compound. Israeli forces arrested over twenty Palestinian worshippers, including seven children. Witnesses and officials of the Islamic Waqf attest that Israeli forces attacked worshippers for no reason and without warning. Public Relations and Information Coordinator for the Islamic Waqf Firas al-Dibs warns of escalating Israeli violations against Palestinians right to pray at al-Aqsa, especially Palestinian women. Meanwhile, hundreds of Israeli settlers continue to raid the holy site with fully armed Israeli police escorts every week. Israeli settlers raid al-Aqsa compound with police escorts, August 2018. Photo credit: Wadi Hilweh Information Center. Ahmad Jaradat is Senior Project Coordinator of the Alternative Information Center (AIC).